A self-help resource for sincere single people who experience anxiety, have insecurities and are reluctant to engage themselves in online dating. Keith Grafman believes success lies in learning to maintain balance and express authenticity with confidence in communications. 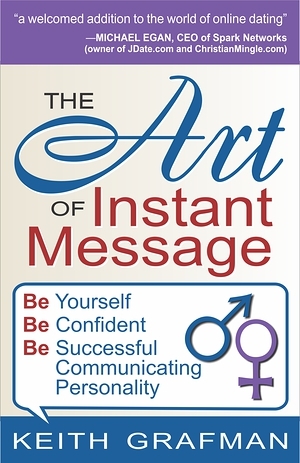 For the reader who successfully communicates via instant message, Keith discusses principles and strategy for communicating effectively within e-mail, and directing later dialog on the phone and in-person. Four appendixes include lists of abbreviations and emoticons, suggested reading, online dating sites and punctuation for social communication. Keith Grafman is a Renaissance man and professional salesman who believes in finding true companionship through honesty and confidence. He began his online dating ventures while attending Dickinson College, from which he graduated in May, 2006 with a bachelor’s degree in international business and management. Over the years, Keith has encouraged many men and women to search for companionship online. He helps his clients create successful online dating profiles and teaches them to communicate effectively, with confidence, by being themselves. Keith’s online dating pursuit led to his getting married—a relationship that began with a string of e-mails. For more information regarding Keith Grafman’s seminars, public presentations or private consultations, please contact him at AdviceForDaters.com.